Gl�gg is mulled wine. In Swedish and Icelandic it's Gl�gg, in Norwegian and Danish it's Gl�gg and in Finnish and Estonian it's Gl�gi. Or so I'm told. All around, it's a pretty nice addition to the holidays. My mom has made it in the past, and I've had it at many a Swedish Christmas party, so this year I decided to try my hand at it a few weeks ago. Good news! It's easy! 4 liters (or, one gallon) Burgundy wine. 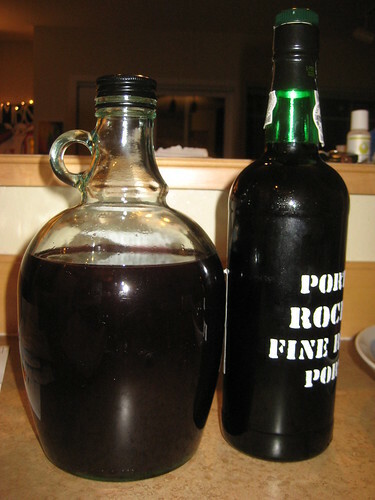 1.5 liter plus 1.75 liter Port wine (approx 1/2 gallon Port) Port is a sweet red wine and you can look for domestic types Port, not necessary to buy Portuguese kind. 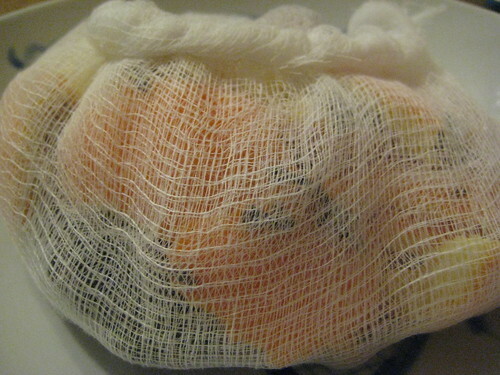 Put figs, peel, cloves, cinnamon and cardamon seeds in cheese cloth. 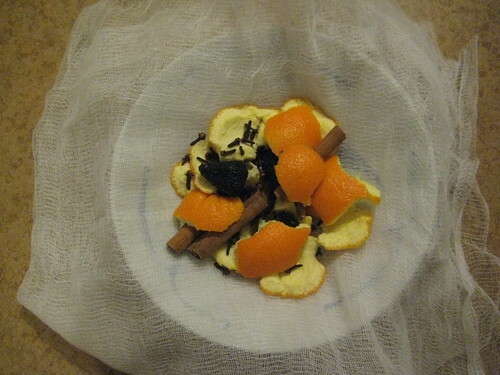 Note: Since you don't want these bits floating around, you'll need to make a loose bag with the cheesecloth. I'm not sure what the usual method is, but I closed up the cloth by folding over the edges a couple times and sewing them with a needle and thread. 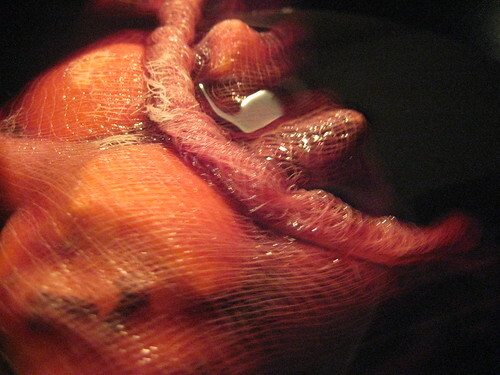 Heat up 1 liter wine and brown sugar and let sugar dissolve, without boiling wine. Add remaining Burgundy and Port wines to mixture and place cheese cloth bag in pot. Let this simmer until warm, do not let mixture boil. Seriously... don't let it boil. 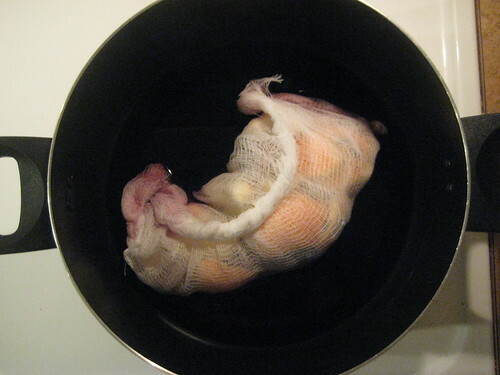 Leave Gl�gg in pot overnight with spices, fruits. Pour mixture back into bottles the following day. Some of the liquid will evaporate. I added a little bit of brandy afterwards to give it a little something extra. 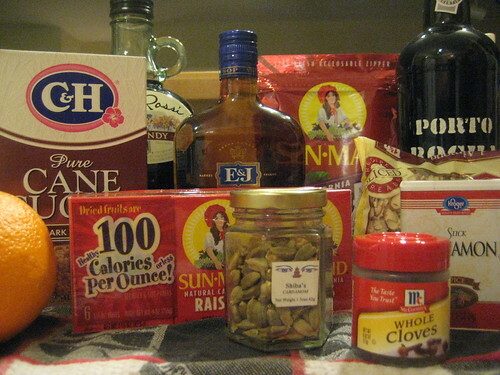 I've seen recipes that add vermouth, vodka, everclear, aquavit.. it seems to be a matter of taste. There you have it!